Well, this is a dreadful example of how not to conduct a blog. I’ve moved all of my typewriter stuff to Instagram. 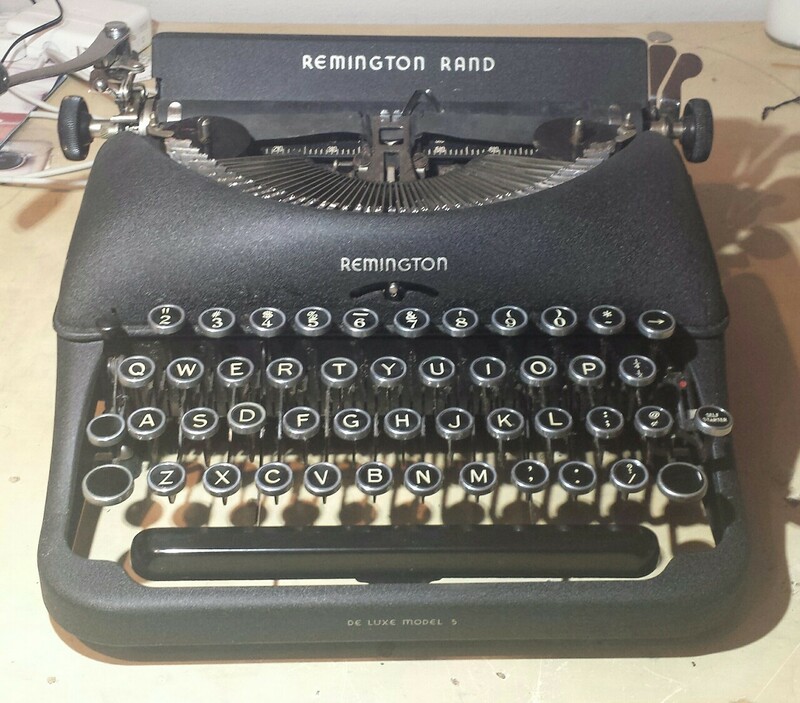 @TheTypewriterGuy Follow! Check out what I picked up for a song yesterday! This is a beautiful piece of machinery and in remarkably great condition. I barely had to put any lubrication on it. With a new ribbon it’s typing like new. Someone must’ve really cared for this machine. With the exception of the pencil shavings inside that seem indicative of most typewriters of this era, it’s a wonderful machine. According to Professor Polt, this little beauty cost $54.50 new, which is around $589 today. I really love the streamlined look of this era. It reminds me of work by the great industrial designer Raymond Loewy. I’m a fan of the Art Deco and I see hints of this in the design of machines of the 30s and 40s.. Curious thought: Is there a central database or list of platen diameters? If not, why not? Surely there must be something out there. It would really help the DIY community to know these numbers. As you can see, that rubber roller has a depressed flat side. This makes paper feeding very difficult. TONS have been written on the internet about softening rubber, replacing platens, etc. There are some companies out there that will do it, and knife141 at Instructables has a wonderful bit about doing it yourself. I cannot speak to the success of either as I’ve not gotten this far, but their work looks really great. So there I was, trying to be polite, and not say something I would regret about the expensive forum for leadership drink the Kool Aid and be happy whatever, when it occurred to me: Why not fill in the flat? Bear with me for just a moment.. Imagine a cylinder, like a soup can, and cut a vertical slice of the cylinder off. If you wrapped paper around that cylinder you would see an arc where that slice was. Why can’t we imagine the arc as a space to be filled? So that area at the top, which I’ve kept the outline of the circle to illustrate the arc, that’s how I’m looking at the flattened platen issue. I’m thinking it’s possible – maybe – to fill in that arc. Perhaps with another piece of rubber, although cutting might be an issue. A good thought that came to me was a glue stick, as I have this in mind for the smaller rollers. What about 3D printing this arc to fill in the flattened part? Granted you’ve still got (probably) a hardened roller that is very old. Never the less, maybe it’s possible. Heck maybe it’s possible to 3D print the whole roller using some soft compound that mimics the rubber from an original platen.